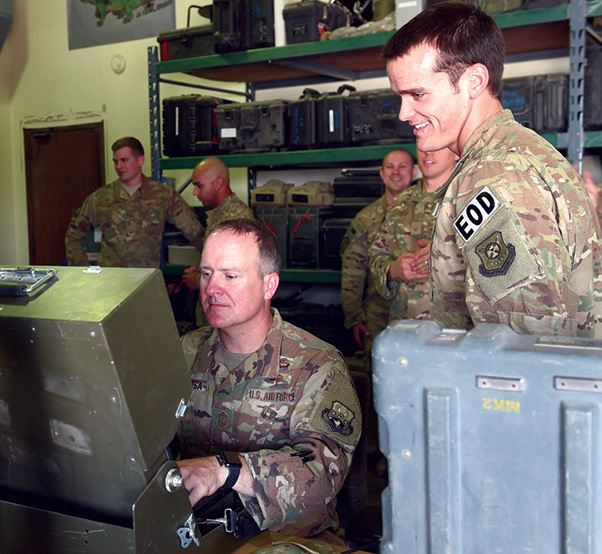 Senior Airman Mike Rodgers, 407th Expeditionary Civil Engineer Squadron explosive ordnance disposal team member, explains to Chief Master Sgt. Timothy Pachasa, 386th Air Expeditionary Wing command chief, how to operate the controls of an Andros F-6 robot, May 21, 2018, at an undisclosed location in Southwest Asia. Pachasa visited the 407th Air Expeditionary Group to brief Airmen on expectation leadership and received an immersion tour to get a better understanding of the mission. Rodgers is deployed from Nellis Air Force Base, Nev.